Android Leads The World Android News ANDROID MARSHMALLOW UPGRADING FROM 4.6% TO 7.5% HOW??? ANDROID MARSHMALLOW UPGRADING FROM 4.6% TO 7.5% HOW??? Google has updated its Google Play distribution data for the seven-day period ending May 2. 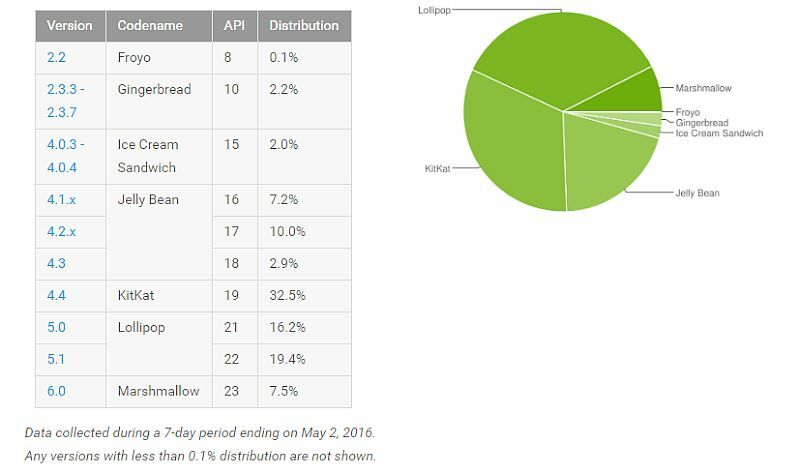 According to Google's latest Android distribution chart, Android 6.0 Marshmallow now runs on 7.5 percent of active Android devices. This is a 2.9 percent increase from the April figure of 4.6 percent. Recently Android oem manufacturers start updating his flagship devices 2 latest Android version and monthly security updates. Samsung start updating is flagship devices like Galaxy S6, S6 edge, note 5, Galaxy S5 Note 4 and Note Edge. HTC:- One M9, One M8, One M9+, One E9, One E9+, Desire 826, Desire 820 and Desire 816. SONY :- All Z series start receiving Android Marshmallow Update. LG :- LG G3, G4 and G stylo. MOTO :- 2015 Moto X Pure Edition, 2015 Moto X Style, 2015 Moto X Play, 2014 Moto X Pure Edition in the U.S, 2014 Moto X in Latin America, Europe, and Asia, 2015 Moto G, 2014 Moto G and Moto G with 4G LTE, Droid Turbo, 2014 Moto Maxx and 2014 Moto Turbo. Android Manufacturers now launching his devices with all new Android Marshmallow in above mid range Smartphones. In upcoming Months we will see Android N (6.1 or 7.0) release for Google Nexus and Android One Devices, and that time same condition of marshmallow with 1% or 2% devices running on Android N.